We are a small organic heirloom farm located in Crawfordville, Florida. You are welcome to pick up at the farm Sunday - Friday at 4 p.m. or at the Organic Growers' Market at Lake Ella, Tallahassee, Florida, on Wednesdays from 10-11 am until 6pm. 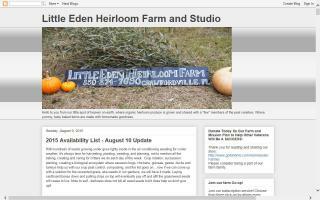 Thank you so much for your interest in our Little Eden Heirloom Farm! We are closed from Friday at 4 p.m. until Sunday morning.